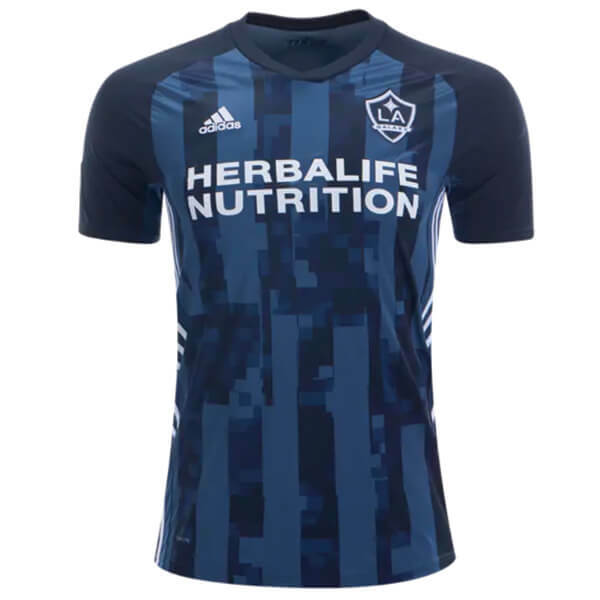 This is the new LA Galaxy Away Football Shirt 2019. After finishing with the worst record in the league in 2017, ZLAtan and the Galaxy just barely missed the playoffs in 2018. New coach Guillermo Barros Schelotto won two Primera Division titles with Boca Juniors before heading to LA. Former midfielder Juninho, a member of the 2011 MLS Cup champions, returns to the squad. . The 2019 LA Galaxy Away Jersey is “Night Navy”. On the front panel, a blue and black vertical graphic print, with a solid blue back. White adidas stripes on the sides. Sewn on team badge. SoccerLord provides this Cheap LA Galaxy Away Football Shirt also known as the Cheap LA Galaxy Away Soccer Jersey with the option to customise your football kit with the name and number of your favourite player or even your own name.